Releasing the button makes the marking menu disappear. Marking menus are circular, with items arranged like the slices of a pie. Holding the right button pressed and moving around in the menu will highlight the various entries. 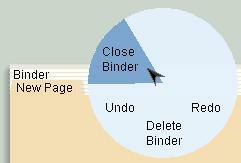 To select an entry, move the mouse cursor into the desired slice so it highlights, and release the mouse button. To make the menu go away without selecting anything, move the cursor to the center of the menu or outside the pie so no entry is highlighted, and release the mouse button. 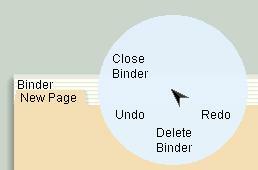 For example, you can close a binder by selecting the menu item to the left of the Binder menu. Marking menus are designed to help you select entries very quickly. One advantage of the circular menus is that the body learns directions better than distances. This means that dragging the mouse in a certain direction to locate a menu entry in a circular marking menu is faster than moving a certain distance down a list to an entry in a traditional, linear menu. The transition appears with its center where the marking gesture started. If the gesture is not recognized, the text ‘Unknown Mark’ will be displayed instead of the command-name and nothing will happen. If you stop in the middle of the gesture, the marking menu will pop up and you can select the desired item as before. Note that you use the same gesture in “marking mode”, i.e. without seeing the menu, as in “pop-up” mode. This means that you do not have to learn separate shortcuts to work more efficiently; you simply speed up the gesture, and when you do it fast enough, the menu no longer appears.